The book assembles a selection of articles previously published at the research blog “governance across borders” between 2009 and 2012. Only minimally edited, the articles have been thematically (re-)grouped into chapters, which are opened with short introductory remarks. The contributions in this volume come from a group of fourteen scholars, all working on issues in global and transnational governance, and representing a diversity of disciplinary and geographical backgrounds. They are sociologists, political scientists, organizational and management scholars; they come from France, Germany, Ghana, Great Britain, India, Russia, Slovenia and the US. Selecting, editing and grouping was conducted by the editors of the governance across borders blog, Leonhard Dobusch, Philip Mader and Sigrid Quack. Blogging follows a chronological logic and is mostly inspired by current developments. Specifically, a blog run by an interdisciplinary and international group of researchers delivers a sequence of highly diverse articles. By selecting and thematically grouping the articles into an edited volume, we make it easier for potential readers to grasp lines of arguments and common themes that span single blog posts. We’ve found that many of our posts have a more lasting effect than expected, being sought out months or years after their publication, and evidently supplying information and insights worth preserving in a more structured format. This form of presentation also highlights the continuities and changes over time that cannot be grasped in an individual blog post, or in the thematic potpourri which our blog chronology may sometimes resemble. It is a way of tracing our topical and intellectual development over time, providing more coherent answers to the questions we grapple with day-to-day. The contributions in this volume address both a general and an academic audience. While we have received a lot of positive feedback to our blogging over the past three years, we have also recognized that the format is still alien to a substantial part of our potential audience. By combining the traditional book format – produced with print-on-demand technology – with the possibilities of the modern digital format of an e-book, we hope to make our writing more easily available to readers not yet familiar with subscribing to RSS feeds or not willing to follow a blog on a daily basis. The Blogbook, as our research blog, aims at disseminating the results of scholarly work to a broad audience under the open-access paradigm, in line with the Berlin Declaration on Open Access, launched by the Max Planck Society in 2003. Governance across borders: transnational fields and transversal themes. Leonhard Dobusch, Philip Mader and Sigrid Quack (eds. ), 2013, epubli publishers. 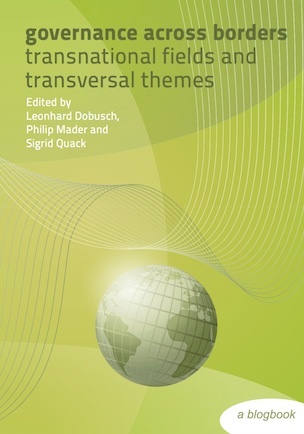 With contributions by Domen Bajde, Sebastian Botzem, Kirsten Gollatz, Peggy Levitt, Olga Malets, Soumya Mishra, Glenn Morgan, Elke Schüßler, Matthias Thiemann, Sabrina Zajak and Solomon Zori. The book is licenced under a Creative Commons Attribution-Share Alike 3.0 Germany license.